It has warmed up a bit here. Not a lot. But the sun is shining. It’s nice to have my little Duraflame stove hooked up in front of the couch to keep my feet warm. I understand there’s some crazy weather going on in other parts of the country. I’m ready for temps way on up there…say 50 degrees? I had a doctor’s appointment with my doctor this afternoon that I made some time ago, but some blip in the new year’s insurance has occurred, so I had to cancel it until I can get things straightened out. Always something, huh? My cough is much better, but still lingering. I just adore this plant. Can’t at the moment remember what it’s called. But the red blooms are so lovely and cheerful. Do you know what it’s called? 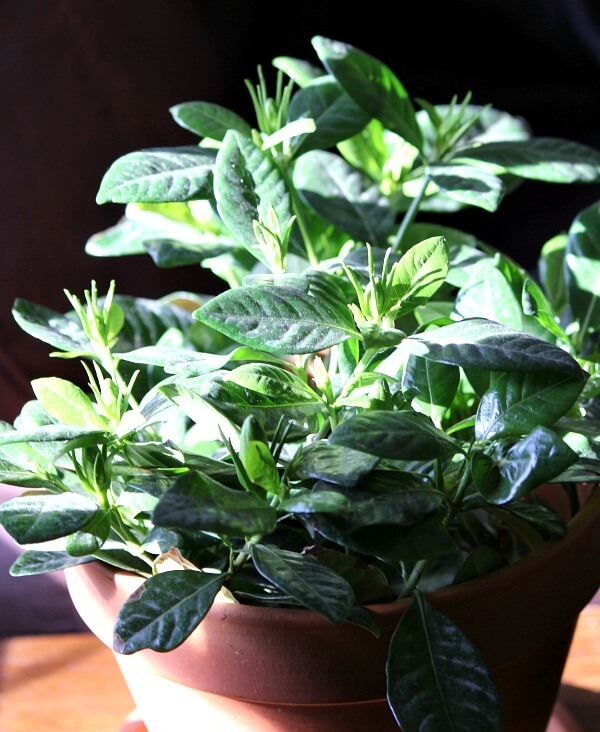 In the dry winter indoor weather, sometimes it’s good to spritz the air around your house plants with a bit of water for humidity. I’ve also got the vaporizer going for my cough. Abi sometimes sleeps against my back at night and she’s like this ten pound little water bottle! Charlie always sleeps at the foot of the bed. I really thought this gardenia would have bloomed by now. There are a lot of blooms on the plant. They just haven’t flowered yet. I keep going over to it and sniffing at the buds, but no wonderful scent so far. 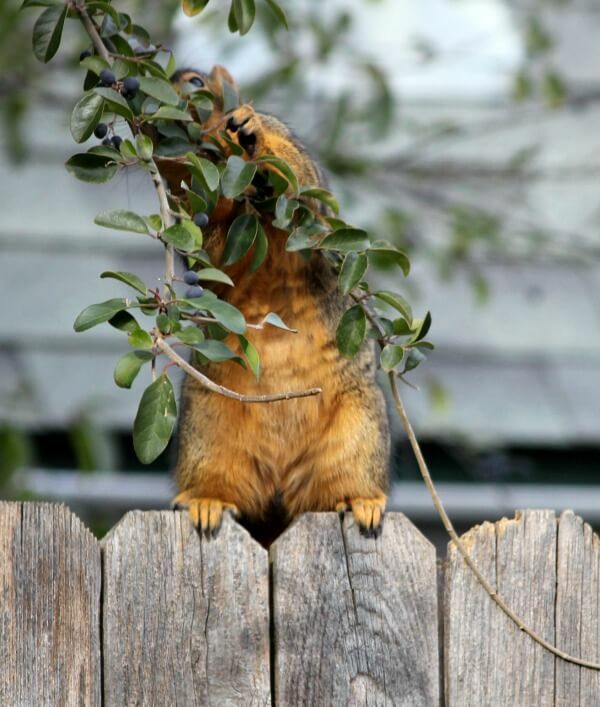 I photographed this squirrel on the fence reaching up to the tree from the other yard, pulling down berries to eat. They are so amusing to watch! If you think this font size is too small, would you let me know please? I’m still tweaking and trying to get this blog attuned to everyone. It seems to be the default font size, and I haven’t figured out how to change it yet. I’m experimenting with a bigger font tomorrow. Will see what everyone thinks. Hello. That house plant is an anthurium. And, by the way, the squirrel is eating berries from a privet bush. Some people have thought it was a lilac but it is a privet, often used for hedges. The squirrel photos are delightful. Looks like a female — she’ll be having babies before you know it! Well, it sure does smell wonderful in the spring. The font size is good but the font color is too light for my “older” eyes. Enjoy your blog. Pretty pictures! I agree, the color is too light ! The plant is an anthurium! Beautiful!!!! Love the pretty plant and in your signature color too. Your little furry visitor is pretty cute too. It is indeed my signature color! YOur red plant is a calla lily. Sure is a pretty plant. Hi Brenda. I think your beautiful plant is an Antherium. Stay warm!! 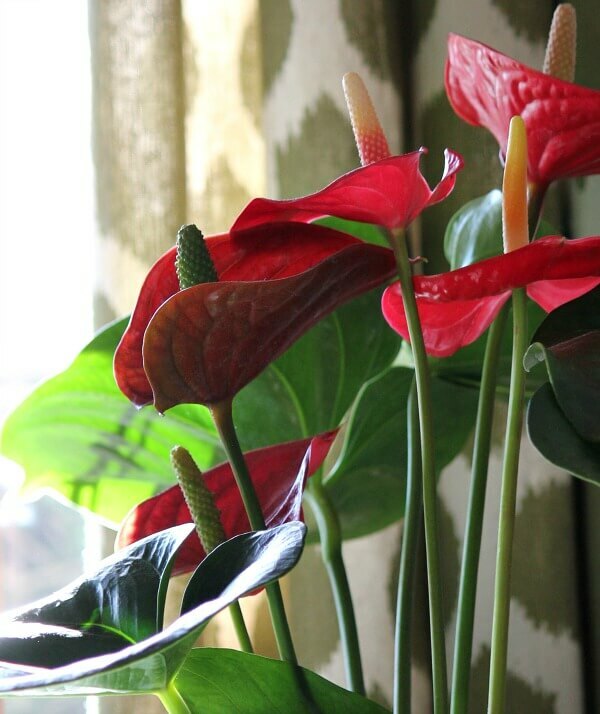 THE BEAUTIFUL PLANT IS KNOWN AS AN ANTHURIUM, ALSO CALLED RED TONGUE . Red tongue. Had’t heard that. 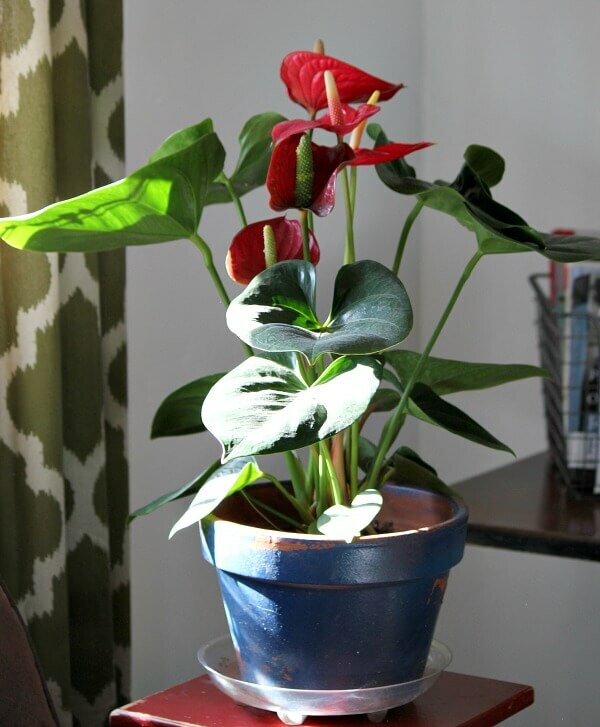 Hi: Your plant is an Anthurium. I first saw them when I lived in Hawaii for a couple years in the 80’s. They are lovely. Yours is beautiful! Never been to Hawaii. Must be beautiful there. thanks for whatever you did to get your blog back on bloglovin. I can now read your blog on my feed. The plant with red blooms is a bromilaid. We also have very cold weather (19 this morning) which it not normal in Georgia. Also we have had flu all week which I understand is widespread. I can’t wait for warmer weather! The designer knew how to fix that. I’m so glad you let me know though. Good morning Brenda! It has been in the 30’s here in Cental Florida this week and I’m ready for some warmer weather. Your indoor plants are lovely. Hope your Gardenia blooms soon. Have a great day! Wow, thirties in Florida. I was there once in February and it was quite warm. I just want to rub that squirrel’s belly. I had the same reaction! Looks so soft. 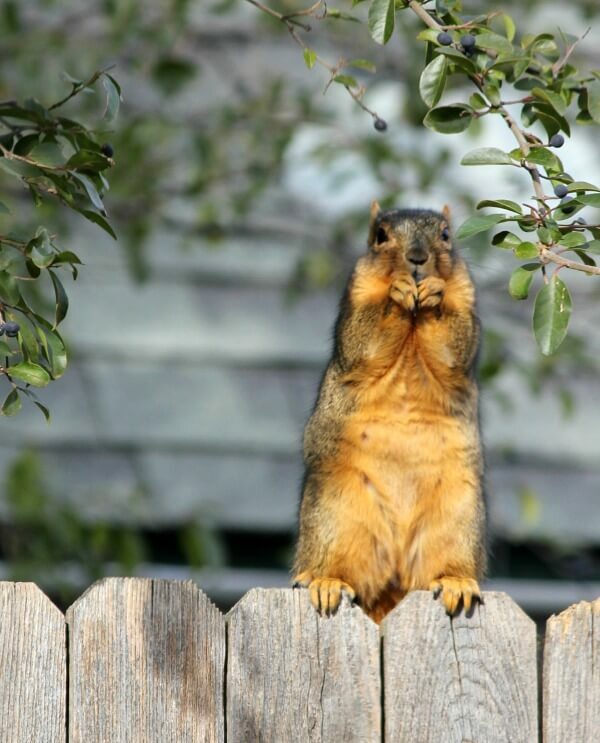 Brenda, I really like your squirrel photos today. Such little entertainers. read if it was a bit darker. Your former one was perfect. with this must be a Lot of work. Hope it turns out perfectly for you. I’ve been working on trying to get the font darker. Love your blog, missed it. However, if the font isn’t darkened I’ll have to give it up – please fix if you can, I don’t want to miss any more posts. Thank you, thank you. I promise I’ll get it fixed. I mentioned it to the designer. And she said she made it darker and to clear your cache/history. The font looks great to me. I enjoy your blog. The font size is fine but the color is too pale. Makes it hard to read. I love Gardenias but I have never been able to get them to grow. They smell so good though. Some of neighbors have them in their flower beds. I need to find out what the trick is to growing them. I’m looking forward to that glorious scent. I’m working on getting it darker or thicker. Font size is ok but it is very light which makes it difficult to read. I know. I keep working on it. Just haven’t got it figured out yet. Font size is good,63,reading w/o my glasses,text could be a little darker or bolder. Pictures are nice and clear. Good luck with the cough,it seems to longer after the crud here in NY is gone! I will get that fixed by and by. I’ve been digging into the code. But I don’t want to break something. Oh, I’m so glad you gave me that feedback! Faster too? The pics of the squirrel you took are adorable. I’ve never seen the color of fur on that little guy before squirrels (pretty). He’s got a plump tummy so he must be getting plenty to eat. The font is fine but like everyone else it’s pale. I personally need a darker print. Thanks! That’s what I thought: Squirrel doesn’t look like he misses many meals! Brenda, I love the new blog look. The header is beautiful! I love the font and everything else too. Sorry to hear about the insurance, it is always something. But I am happy to hear you are feeling better. It is freezing here! Tomorrow it will be 9! About 35 below are typical temps at this time and yesterday we had 11 inches of snow! Finally was warmer here today and my cough was better. I think the font size is ok….at least on my work computer, I don’t know if I could see it on my iPad, which is much smaller. That’s a great photo of the squirrel eating the berries!! Tomorrow’s post will have a bigger font. We’ll see if readers like it better or not. I love your plant, whatever it is. I agree with the others that the font size is good but too light. We have a squirrel or two or three that we feed. So cute to watch them sit up and hold food in their paws and nibble. I just can’t seem to get it to look darker somehow. But I will prevail! I know. Me too. I’ll have the designer change it if I can’t figure it out. I am missing your blog roll. Enjoyed having blogs to travel to. I will be adding the blog roll in the menus/navigation bars. I just haven’t gotten around to it yet. The font is great. Wonderful squirrel pictures! Frigid here in IL still with sub-zero wind chills. I looked at the extended forecast and was so surprised to see a big warm-up on the way with Wed and Thurs being in the 40’s. Will feel like a major heat wave! Warmer here today. Thank goodness! 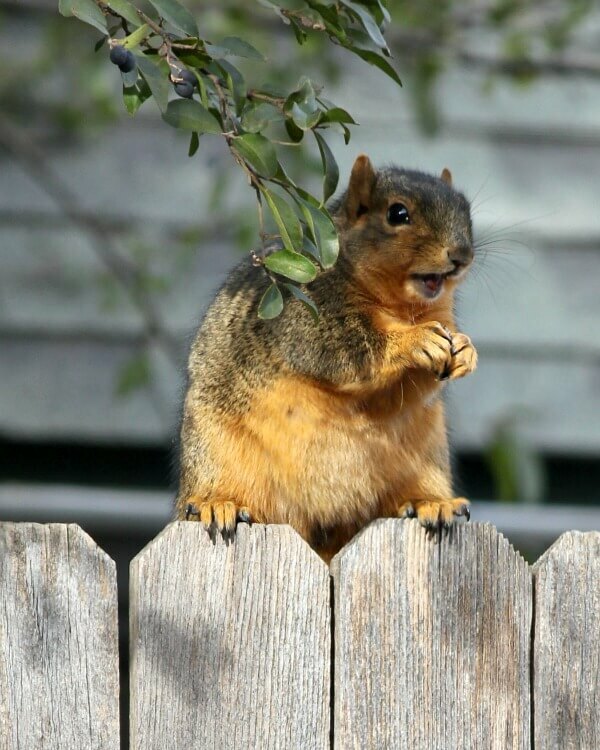 Such good pictures of that chubby squirrel. She’s much more colorful than our gray squirrels around here. In one of the pictures it looks to me like she has a big grin on her face and is about to say something, or maybe I’ve got advanced cabin fever. I agree with the other commenter that thinks the squirrel is going to be a mama, maybe sometime in late winter/early spring. That squirrel’s tummy has some little feeding stations lined up and showing if you look closely.. Imagine Charlie’s glee when he discovers that Mama Squirrel has baby squirrels for him to watch, too. He will be vibrating “Squirrel, Squirrel. Squirrel” all of the time! Oh, I hope I see baby squirrels! Everything seems to be going well with the move. Love that plant! I like a little darker font but I know you’ll get it like you want it! I hope it’s dark enough now. I’ve been working on it. The style and size of the font are good, but I would tend to agree that a bit darker or bolder would be easier to read. I have eyesight issues. I know you are working hard and it must not be easy to try and please everyone. I would not leave due to the font you presently have. Take care. I’ve since darkened it. I hope it’s dark enough now. The squirrel are so darn cute. Those fat little bellies with the reddish fur! They can be little nuisances but I still like seeing them. You got some great photos of the one eating the berries. It is so cold here that I finally after all week I took the dog for a walk around the block and by the time I got home I thought my fingers were going to fall off! And, yes, I was wearing gloves! It’s supposed to warm up to around 30 degrees next week and I’m really hoping it does! I guess it was around three degrees when I was out with the dog today. Yikes! The size of the print is fine for me, too. I like the red house you have next to your responses to comments. Is it a house you know or did you choose it from a selection of images? This office I’m typing in is freezing. It has a north and a west window and it just gets so darn cold. And the windows are newer, too. I feel like I would like to put insulation in all the walls and then hang tapestries! Gotta go; too cold in here! I’ve had that house image as a part of my blog for many years, since nearly the beginning. A designer found it for me. It just cropped up when I switched to WordPress. Brenda, you and your blog are amazing! !